I'm not into horse owners names, never was, never impressed, after all, I've owned lots of horses in the past myself. Though I must admit, I have fond memories of watching races as a kid and being able to identify the silks of Windfields, Sam-Son, Beasley, etc. The reason I mention this is that I always assumed that Moreno was named after an identifiable celebrity. After handicapping the Breeders' Cup Classic (in less than 2 minutes, I might add) and coming up with Moreno as my pick, I finally decided to look into who the horse was named after. He came into the NFL in 2009 and immediately he rushed for just under 1,000 yards as a rookie. He could have been thought as the next OJ, so it makes sense to take a shot and name a horse after him. The one good thing about Moreno being in the big race is that his entry might confuse quite a few horse racing fans (Horse Racing Fan: Someone who watches horse racing once or twice a year, and might even wager on those days). The Fantasy Football crowd know full well that Moreno is out for the year after a promising start with his new team, the Miami Dolphins. Some fans may think that Moreno's entry is a misprint, and automatically dismiss this horse from their tickets creating an extra overlay. She even dated Elvis Presley and found him boring. It would make sense to name a horse after her, but not a male horse, so I really didn't think it was named after her. Turns out he has been playing 4 years, but already has 4 goals in 70 games (for all I know, this is some sort of record pace). I started thinking Moreno could be a young soccer legend. Much to my dismay, I just found out that the owner of Southern Equine Stables is Mike Moreno. The guy named a horse after himself. To the best of my knowledge, even the least humble person in horse racing today, Frank Stronach, who has bred, owned and named close to a million horses* (Cangamble estimation*), hasn't named a horse Stronach. Perhaps Awesome Again was named after Stronach came up with one of his ideas, like the quadruple superfecta, but I can only speculate. Still it was not named after him directly. 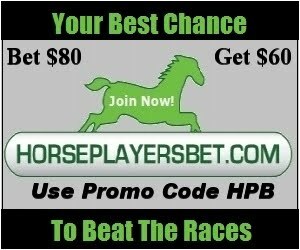 If you haven't checked it out yet, HANA's Horseplayer Monthly (Breeders' Cup Edition) is out. The free e-magazine is full of great insights and handicapping tips, as usual. Pat Cummings recently wrote an article about run-ups. To me, run-ups are track specific and since I'm not a pace handicapper, they don't affect me as much as they affect others. Still, the main point is a good one, since gambling dollars are at stake, why can't those who pay for the show, the gamblers, get all the information and then decide what is important and what isn't. It really is time for a change. The problem has more to do with making the big change, and getting universal agreement to make the change. I'm sure, changing formatting would be costly to implement to begin with but it is a necessity, however radical change is something the the horse racing industry seems to fight as it is full of captains who are masters of going down with the ship rather than change things. Is it too much to ask to find out the actual running time of a horse from where the beam kicks in to the finish line for horses other than the winner? I still don't think a universal answer exists when dealing with a horse shows it is second beaten 10 lengths as to whether it finished 2 seconds slower than the winner, or it was beaten 10 physical lengths at the finish, and if this is the same scenario for each distance, for other parts of the race and from track to track. How often is it subjective and much of it is subjective? We don't need subjective when it comes to times, not in today's day and age. We might need new formatting, a new past performance line or additional info which shows MPH by the individual horse at various points of call and the finish (or of course, make a length equal exactly .2 seconds without guessing). Perhaps MPH when it comes to actual distance traveled, and incorporate run-up times too. Track variants/speed figures would be easy to manufacture, especially after a few weeks of getting the real info. And why not include wind speed in the line like they do in quarter horse races? Put it there, and let the handicapper decide its relevance. It is the 21st Century and horse racing needs to progress past the stopwatch.